Published: Jul 27, 2017 · Modified: Apr 12, 2019 · By Jen Sobjack · This post may contain affiliate links. 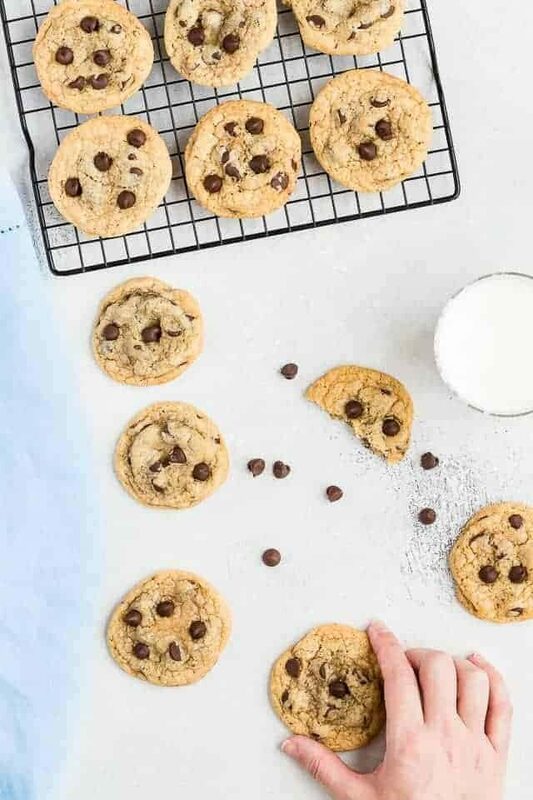 These Chewy Chocolate Chip Cookies stay soft even after they’ve cooled. Bread flour, egg yolk, and corn syrup are what gives these cookies their chewy texture. You’ll fall in love with these after just one bite! Fresh from the oven warm, soft, and gooey are exactly the way I love to eat a chocolate chip cookie. I’m pretty certain most people feel this way as well. 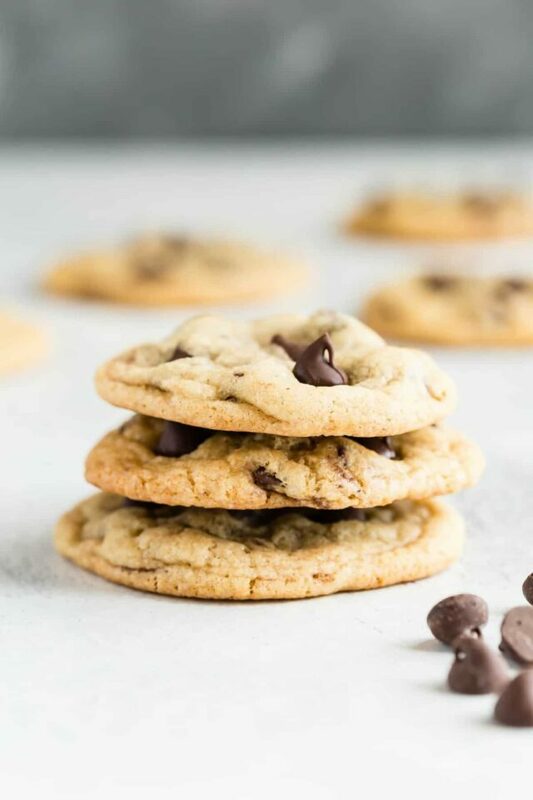 Over the years, I’ve made various versions of this cookie in the form of chocolate chip salted caramel cookies, coconut mango chocolate chip cookies, and chocolate chunk apricot cookies. They all have a soft and chewy quality about them. While thumbing through a Bake From Scratch magazine recently, I came across a chewy chocolate chip cookie that called for bread flour. Not all bread flour, but a small portion. Apparently, the high protein in bread flour adds to the chewiness of a cookie. This had never crossed my mind before but it makes total sense. The higher protein content helps with gluten development. More gluten equals more chew. But the trick is to not overdo it with bread flour or the cookies will be too dense. 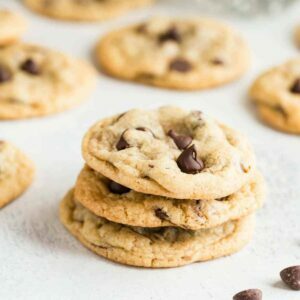 How to make chewy chocolate chip cookies from scratch? My first tip is to cream the butter and sugars together really well. Let the mixer run for 4 minutes. Stop a few times during the process and scrape down the sides of the bowl with a rubber spatula. You want the mixture to be fluffy. The rest of the ingredients are pretty much staple ingredients in all my cookie recipes: egg, egg yolk, vanilla, all-purpose flour, bread flour, corn syrup, baking soda, salt, and chocolate chips. I’ve never used bread flour in cookies before. But we’re adding it today because it helps with gluten development yielding a supremely chewy cookie. The biggest tip I can give you is to let the dough sit in the refrigerator for at least four hours before rolling and baking. This will prevent the cookies from spreading too much during baking. The cookies actually turn out even better if the dough sits overnight. The cookies actually turn out even better if the dough sits overnight. And it will keep for up to four days so you have plenty of time to bake them after making the dough. My best tip for ensuring the cookies bake up thick is to roll the dough balls a tad bit taller. This will keep them from spreading too much and they’ll come out of the oven very thick and puffy. as the cookies cool, they’ll deflate some but keep their thick, chewy texture. It’s always wise to keep an eye on the cookies as they bake. Oven temperatures vary which will cause the cooking time to vary. Bake them just until the edges are golden but the centers still look soft and just slightly under-cooked. In a larger bowl, beat the butter and both sugars together with an electric mixer until fluffy, about 3 minutes. Scrape down the sides of the bowl as needed. Beat in the egg and egg yolk, followed by the vanilla and corn syrup. In a medium bowl, add both flours, baking soda, and salt. Stir with a whisk to combine. Add all the flour mixture to the butter mixture and beat on low speed just until almost fully combined. Gently fold in the chocolate chips. Cover with plastic wrap and refrigerate for at least 4 hours. Preheat the oven 350ºF. 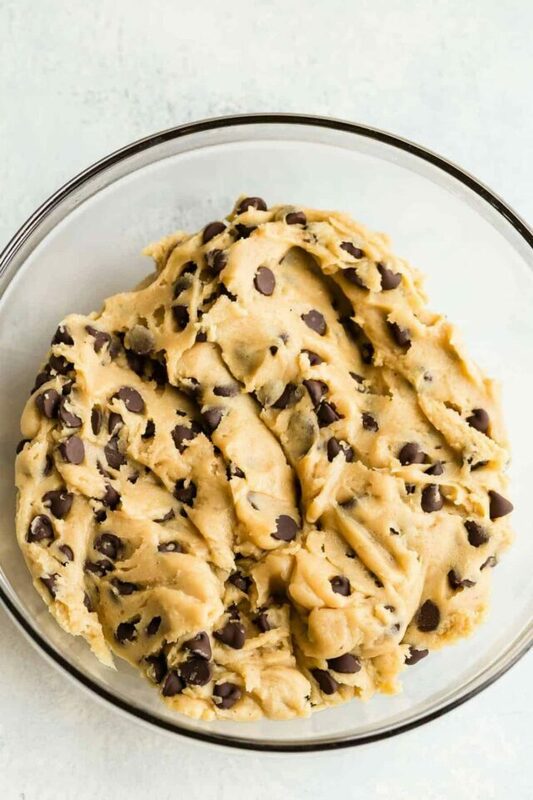 Set the cookie dough on the counter to soften slightly for 10 minutes. Roll the dough into 1 tablespoon sized balls and place 2 inches apart on a baking sheet lined with parchment paper or a silicone mat. Bake for 10-12 minutes, rotating halfway through, or until lightly brown around the edges and just underdone in the center. Cool cookies on the pan for 10 minutes. Remove from the pan and cool completely on a wire rack. Baked cookies will keep for up to 1 week stored in an airtight container at room temperature. They can also be stored in the freezer for up to 3 months. I made this cookies and they were divine. I left the dough sit in the refrigerator for 4 days in an air tight container. The baked cookies even looked perfect after I took them out of the oven. Thanks for sharing your experience! I’m thrilled you enjoyed the cookies. This recipe looks delicious, but I’m wondering if you really meant a whole tablespoon of vanilla? Not a teaspoon? Yep, I did mean 1 tablespoon of vanilla. You said to cream the butter and SHORTENING. There is no shortening listed in the ingredients! I apologize for the misprint. There is no SHORTENING in the recipe! I can’t wait to try this recipe! I find the cookies I make with my recipe only taste best for 1-2 days. 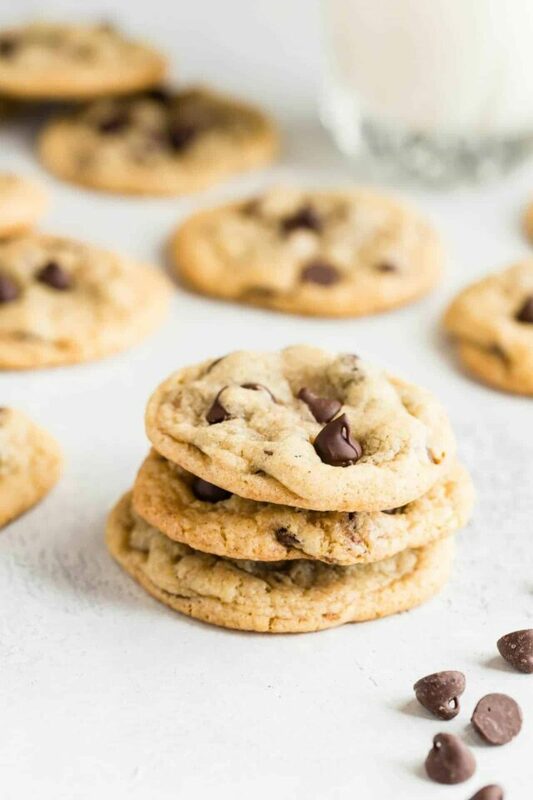 Can this recipe be used to make a pan cookie or one giant round cookie? I haven’t used this recipe to make a giant or pan cookie but I image it would work. I’m with you all the way ! Thank you !